But this week, she is our spotlight artist with her beautiful layout "Believe". The beautifully framed photo is Beverly's niece. The soft colors and lacy techniques Beverly used compliment the photo so beautifully. Love the ribbon weaving and the sweet bow with the tiny fairy dangling as if dancing in the air. The floral clusters frame the layout to perfection. Love how Beverly used the DA fairy as a mask, very creative!! Color perfection! Thank you for sharing your work with us in Swirlyville!! We love it!! Visit Beverly's scrapping blog for more inspiration! Hi there scrappers and swirly savages! I wanted to take this moment to send out prayers and hugs to all those in Norway who have been affected by such a senseless act of terrorism; then again all terrorism is senseless. We are so very sorry and you are all in our thoughts!! Much love and many hugs!! CHA is over and everyone is home. The Swirlydoos workshop with Ingvild and Trish were a success! For all of us attending the classes live on Ustream it was a lot of fun!! The projects are gorgeous. There are still a few kits available in the Swirlydoos store and the Ustream classes were recorded so you can still take the class! Everyone is anxiously awaiting August's kit, Poetry en Prose. A few of the DT members have already received their kits and I all I can tell you is that you WILL NOT be disappointed, not that you ever are, but I LOVE this kit! We have another blog hop coming up on August 5th. There will be a Bo Bunny kit up for grabs to this month's winner so set your alarm clocks and mark your calendars so you can be sure to be here and participate! Have an amazing weekend and remember to make someone smile! OMG!!! The Swirlydoos Store has got the Mistables from Pink Paislee!!! Just think of all the variety that can come out of this collection. Just spray, ink, paint...and it'll be a very unique project. But also journal tags and a chipboard alpha. Do you ever get scrappers block? I know I do!!! I would suggest taking a look at the Swirlydoos Challenge Forum. We have plenty of on going challenges that'll lift that scrappers block and get your creative juices flowing again. One challenge in particular is the Round Robin Challenge. How much easier can it be to scraplift the person before you? But, with your creative spin. I would like to spotlight Team 2 Entries. These girls out did themselves. Kudos to Tracey for her beautiful design that motivated the rest of the team . Usually it takes me 2-3 hours to complete a page. Shell's lift (spot 3) inspired me so much that it only took 45 minutes to finish my layout!!! I love this challenge because you can see how a layout can be lifted. Yet, still have your style. No scrappers block!! To see the other team's layouts visit the July Round Robin Challenge. Or to jump right into a challenge visit the Challenge Forum. and the coloring is amazing too. Look at all those gorgeous layers and awesome distressing. Hope you all get inspired by these two beautiful cards. We sure want to see your cards too. This month, the gallery was full of magical fairytale layouts. Everyone of them was as beautiful as the next. and the challenges are also amazing!! 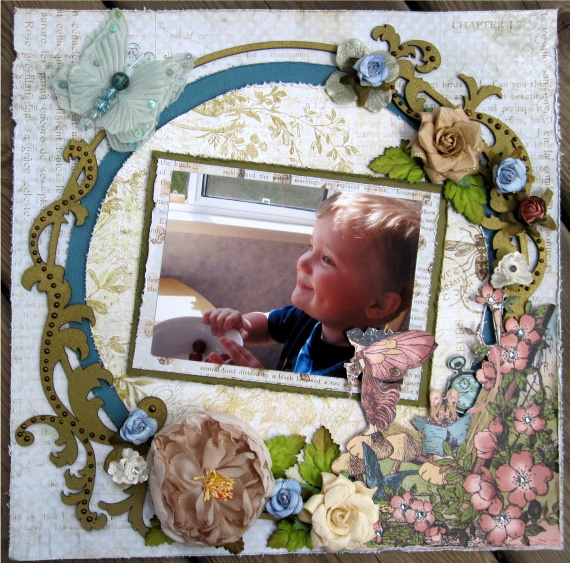 Tammy entered this gorgeous layout in the Budget Blooms Challenge. Who needs Prima and Petaloo??!! (shhhh, I didn't really say that..The fairy did...). Tammy worked magic with her store bought blooms. She worked magic with the paper. She worked magic with the Dusty Attic. She worked magic when she placed the wings on the fairy in the photo. Tammy just worked her magic on it all!! Just look at all of the sweet little fairies sprinkling their magic all over. If you didn't believe in fairies before, i bet you believe in them now!! Tammy, this layout is just magically beautiful!! I hope everyone is staying as cool as possible. This heat wave is over a good portion of the states and has even made temps go over 100 here in Upstate NY. That's saying a lot! Please stay safe and drink lots of water. Our fearless leader is at CHA this week with a few of our members. This morning is the Ustream Class with Ingvild and Trish!!! I'll be at work but will be logging on later tonight to check it out. Can't wait!!! The August add-ons are nearly all sold out. I hope you were able to get what you wanted. 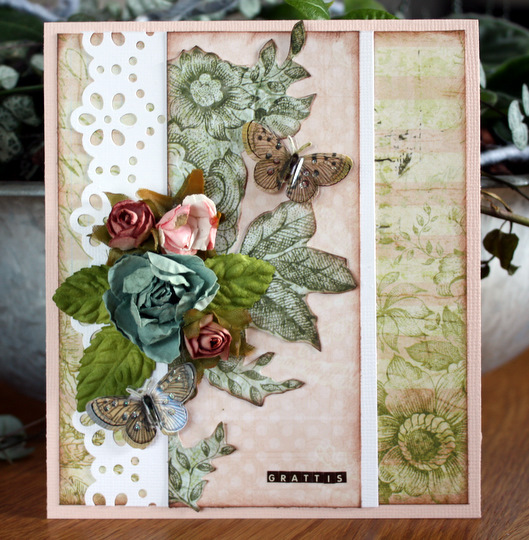 We've had some awesome new tutorials posted this month; flowers, a matchbook mini album and a card. So beautiful. If you haven't taken a look at our tutorial section lately, you should. Click HERE to check it out. We have some activities coming up. Our next blog hop is taking shape AND the Design Team has been working really hard at putting together something really special. This will be something that members and NON members alike can participate in. Keep checking the blog for more information coming soon!!! 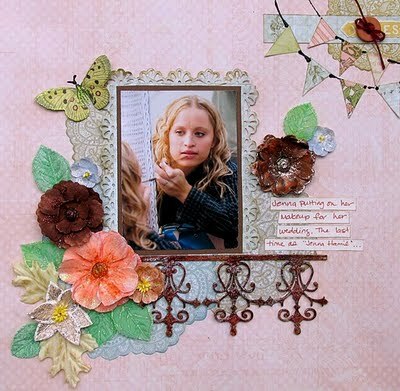 I went perusing through the gallery this morning and just have to show you this gorgeous layout that Lisa (Featherss) created using our July Vintage Fae kit!! Isn't this just the sweetest!!! Have a wonderfully creative weekend! Enjoy the Ustream Classes!!! Their arches and gates are so stunningly beautiful and easy to use. Just look at these gorgeous examples from the gallery. Patti is our newest member and we are so lucky yo have her. 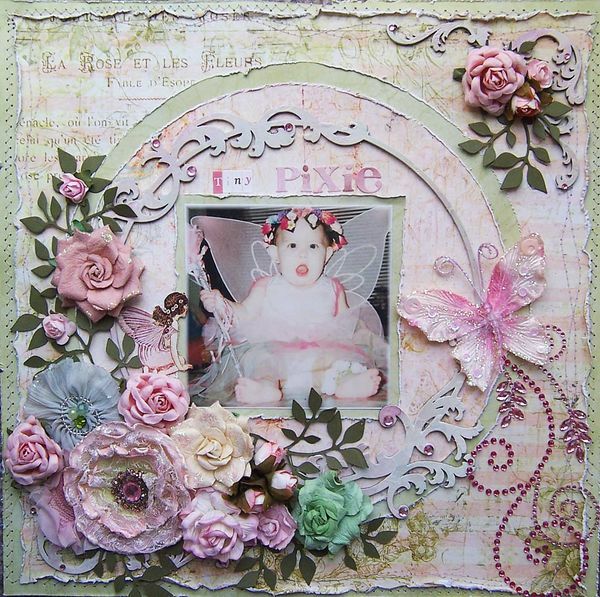 She used her very first Swirlydoo's kit, Vintage Fae, to create this gorgeous page. Thank you so much Patti, for sharing your talent with us! For more information on the Swirlydoos Monthly Kits, please visit our website. I grab a cup of coffee and turn on my computer. Open up the Swirlydoos site and go to the Gallery. Which is the most greatest source of inspiration. You can find the most GORGEOUS projects there. From, layouts, ATC's, mini album's, altered art, etc. And Yes, they make me smile, because .... I can feel the love. The love for the *creating* process, as well as the love we feel for our beloved ones, which we scrap about or for. Love is our starting point. Today I would like to share some amazing cards, that I found whilst browsing the gallery. 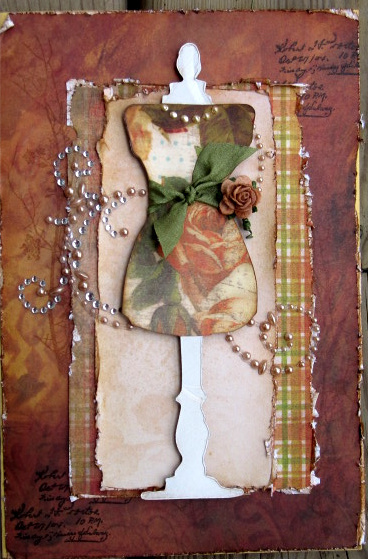 She said that this is her new favorite die, which she dressed up so gorgeously, and made this beautiful card with. 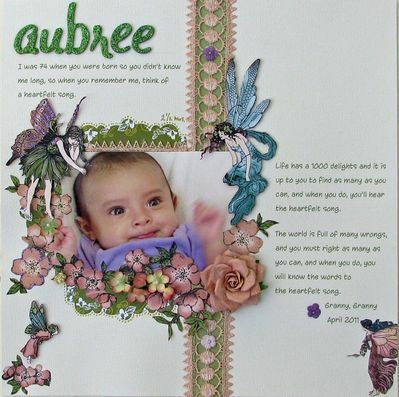 She created this Gorgeous card with her first Swirlydoos kit and said, that she loved her kit. Pips.... we love your card! 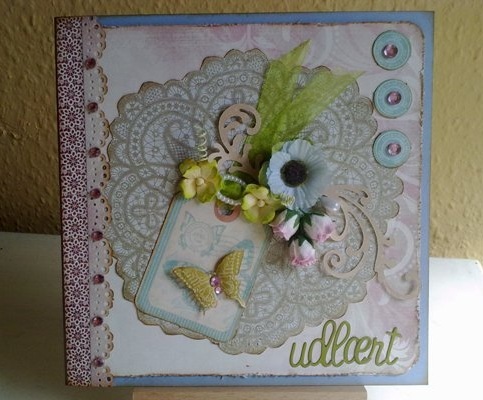 Another great inspiration is the next card from Linda. She created this Awesome Guy card. I simply just Love it!!!! And then the last two *Gorgeous* cards are by Camilla. They represent this month's Vintage Fae kit so well. Go take a peek, in our AMAZING Gallery. Get yourself, inspired and creative. This week I bring you a special LO. 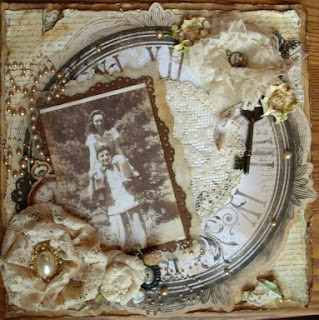 It was created by Patti Hamil, who is one of our newest subscribers. This LO happens to be her first LO with the new kit! And it is amazing. The enhancing of the papers with masking, the beautiful floral cluster with handmade leaves, the little tag, and the sweet tie around the letter in the title. It is the little touches that can fill a LO with personal style. The photo is Patti's beautiful daughter and her son in law on their wedding day. The LO reminded me of the beautiful song Magic by Colbie Caillat. It is all about love. And we sure do LOVE this layout. 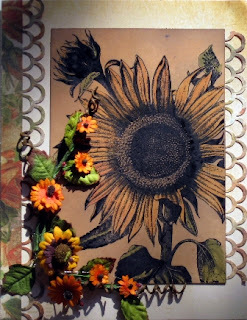 To see more of Patti's work, please visit her blog. You will surely be inspired! I never, ever get tired of saying that. Seems like lots of stuff is going on. Krissy is getting ready to head of to CHA as well as host a most AWESOME workshop featuring Ingvild and Trish. For those of us that are suffering through the fact that we can't be there, we are comforted by the idea that we will be able to attend this workshop via Ustream!!! Wa-hoo! I believe that the kits are in the process of being sent to those of us who purchased a ticket. You have one more day to submit your take on the sketch for our June kit, The Looking Glass. Click here. The sketch challenge for this month's kit, Vintage Fae has been posted and you have until 8/15 to post your entry. Click here. There are 4 other challenges going on right now as well; the monthly and infamous Round Robin, Angelica's gorgeous Butterfly challenge, and 2 SGC challenges hosted by our members. Click here to check them out and jump in. CHA sneak peeks are being posted daily and everyone is weighing in. Click here and see what all the hub-bub is about. We will be having another Kit Reveal Blog Hop. We had so much fun that we are going to do it again! Be sure to sign up to get our blog postings by email so that you don't miss any of our upcoming announcements!!!! Check out these gorgeous pages submitted by our members using our July kit, Vintage Fae! This one is by Joyce. This one is by one of our newest members, Patti. Through the Swirlydoos kits I have discovered the joy of stamping on layouts. Every now and then Krissy adds some gorgeous stamps in the kits. 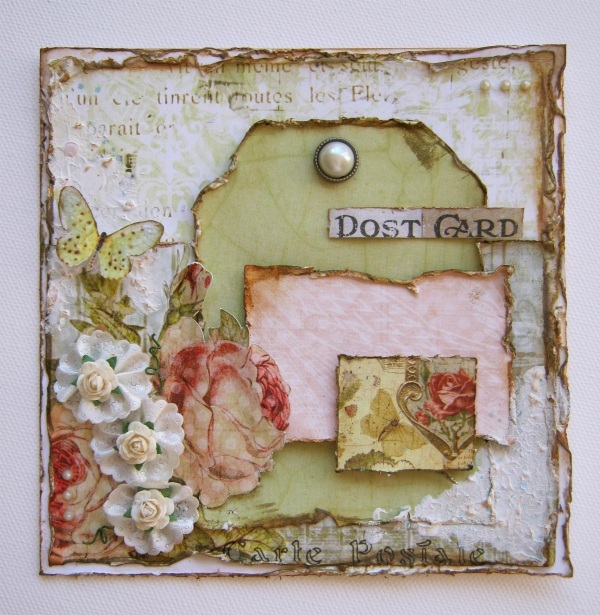 We've had stamps from Tattered Angels and from Prima in some of the latest kits. Irene is a pro at using stamps on her projects. 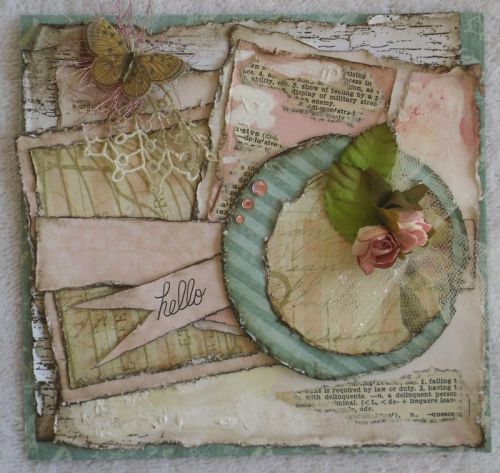 Here is a layout she made for the June kit where she has used kit stamps. But you will find more stamps in the Swirlydoos store's stamping section. This is the basic instruction to make a Paper Bag Matchbook. How you embellish is completely up to you. Score the cover at 1", 6.5" and 7"
I used regular size white paper bags. I only used three, but you can use up to six. For the insert for the paper bags pockets, cut three pieces of card stock at 4.5" x 5"
Embellish these insert to your liking. You can add photos, journaling ephemera....whatever. Depending how chunky you want your mini is up to you. Swirlydoos July Kit Reveal Blog Hop!!! There will be many to come. Now for the winner...... drumroll please!!!!! you won a $25 gift certificate for the awesome Swirlydoos Store. Please email your addy to Krissy. 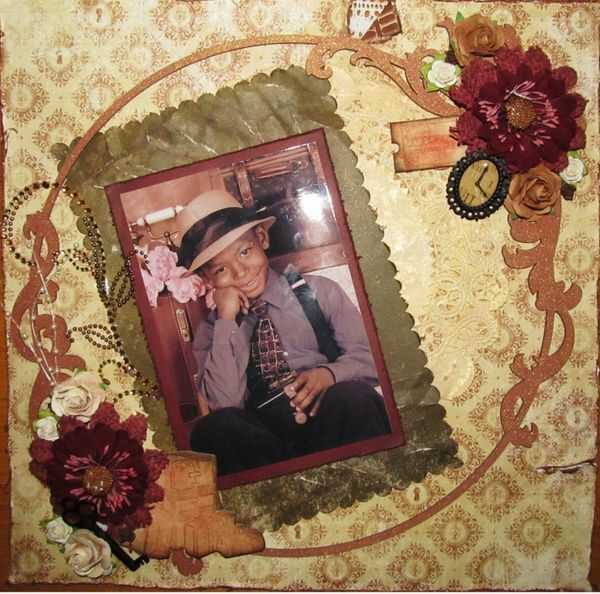 I would also like to thank Lisa V for coordinating our blog hop. She did an AMAZING job!! And of course Krissy, for sponsoring the Blog Hop. 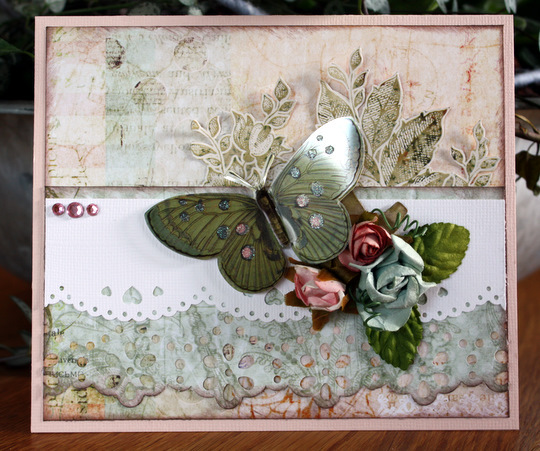 Every month I'll do, a step by step *CARD* Photo Tutorial, which was created from the Main Kit. into the card-section of the Swirlydoos Gallery. If you haven't seen this LO, read the incredible story that Maggi tells us. 1953 Verdun, France – Dad had already gone to his duty station in Verdun, so you had to fly to France with a baby, Margaret, and Craig, almost 5 at the time. The plane was struck by lightening and caught fire so the plane made an emergency landing in Newfoundland. By that time, you must have been scared out of your mind and wondering why on earth you were traveling to this foreign land. But there you were, in France, living in a house with a bullet holes from WWII in the front door. Our french landlady & her son had hidden in a cabinet in the kitchen when the Germans forced their way into her home. Fortunately they didn’t look there and she was ok.
You and Dad lived on the French economy and with the grace that you’ve had all your life, you accepted the situation and set about learning to speak French. You and our landlady, Madam Gaillard, sat with the French/English dictionary and learned to communicate. By the time we came home from France, you were speaking fluent French. This LO is just amazing in fine detail. The doorway scene, blended from paper and photo is incredible. The lamp post, the flowers, the title. All scrapped with love. We don't know what else to say Maggi, except, you have created a stunning LO. And thank you so much for sharing the intimate history behind the photo. That just makes it more the sweetest!! 1) We had our first Swirlydos Blog Hop and revealed our July kit, Vintage Fae. It was a great success thanks to all of you. You have until July 9th to do the hop. I will be randomly drawing a name on the 10th and the winner of the $25 store gift certificate will be announced here, on the blog, on July 12th. Good luck to you all and stay tuned for next month's hop!! 2) We had two new Swirly Girls Challenges start up. These are challenges that our members host. Click HERE to check them out. 3) Everyone has been posting links to upcoming product releases at CHA; and everyone has been weighing in on whether they like it or not. Go check it out. Click HERE. The Design Team has been putting the finishing touches on something fun. Keep checking back often for the announcement. Do you alter a lot? I found this stylish and fabulous Kaisercraft drawer in the gallery. The creator is Tammy/tamh3030. I love how she's decorated it with gorgeous papers, stamps, bling and stuff. If you are looking for the Reveal Blog Hop....just scroll on down!! Check out our home page for details on the kit and the Add On kits! First stop on your “hop” is this blog, so if you are here you are in the right place! We have some beautiful blogs for you to visit today, and trust me when I tell you that the projects you are about to see are nothing short of amazing! 1) you need to visit all of the blogs in order to qualify. 3) Stop by our Facebook page and Like Us! 4) Winner will be announced on this blog on July 12th. All entries will be entered into the drawing for our Grand Prize!!! This month's prize will be a $25 gift certificate to the awesome Swirlydoos Store!!! Let's get the party started!! Your first stop is Lisa G.'s blog . Have fun and get inspired! Something about sweet sweet kisses we give our children, can make our heart skip a beat! Amazing that this is a self portrait Rae did of herself planting a sweet smooch on her son Owens darling cheek.